Material Edge problem solve with new ideas in partnership with industry leaders. No customer is too big or too small, personal attentive support guaranteed without cost unless contracted to carry out a project or through product sales. Material Edge Ltd, formed in 2004, are sole UK and Ireland distributor for Highway product producers Ooms International b.v. and BituNed bv. plus AdhesionXtreme waterproofing tapes as well as a wide range of GRP products. Pen grade, Polymer modified, Oxidised and Clear bitumen for asphalt; producers and manufacturers of bitumen emulsions; highways, roofing and industrial product producers. Hot bond coats such as Sealoflex SC-4 complement asphalt reinforcement using GlasGrid and can be used as a SAMI/Bond coat on rigid pavement overlays. We have also gathered experience in GRP for building and construction applications. We supply anti slip surfaces (nosings, flat plate, gratings etc.) and have expertise in design and production of pultruded glass fibre plastic profiles. Material Edge have considerable expertise in the areas of Construction and Building products in the UK and Ireland. These materials include Bitumen, bituminous materials, aggregates and associated materials, geotextiles and glass fibre grid reinforcements , Glass Reinforced Plastics in flat sheet and pultrusion profiles and waterproofing tapes. The knowledge base in these areas often extends internationally the company having many contacts throughout Europe, Middle East, Africa and the Far East. 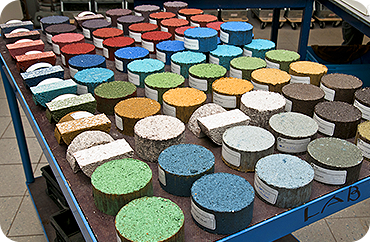 Material Edge are retained by a number of major international companies to carry out market research, attend expert meetings including British Standards and CEN meetings, confidentially visit companies for sale as part of due diligence investigations and act as a consultant on development and production of products made from a range of materials. Material Edge are often approached to look into markets for new products, some of which we have gone on to represent and some of which we provide market research to allow manufacturers to choice a suitable company to work with going forward. Commission sales arrangements are a common service we provide which allows manufacturing companies to retain their product name and intellectual property in a market as well as close contact through Material Edge with the customer base. We have extensive material sourcing abilities having imported and supplied to China, India, South Africa, Europe and the USA. There is excellent understanding in the company of import/export documentation including use of Letters of Credit, tariff classifications and transport related issues.